Lord Alverstoke has too many relatives who want too many things from him. His sister believes it's his duty to foot the bill for his niece's coming-out...and provide a ball for her! His cousin, though less conniving, thinks he should have a ball for her daughter. He doesn't want to host a ball for either. His relatives are just so boring. The last thing he needs is more of them. Out of the blue, a country cousin arrives. The enterprising Frederica is the head of her family- 2 teenaged brothers and a breathtakingly beautiful sister. Frederica is determined to find a husband for the girl who is too pretty for a country bumpkin. The problem is she has no one to put her sister forward in society. Alverstoke, though a distant relative, seems like just the man for the job. At first, he hesitates but it would be a great way to give his sister her comeuppance by having this beautiful girl outshine her daughter at her own ball. Plus, there is something about Frederica herself, a certain twinkle in her eye. She is only passably pretty and 'on the shelf' but he never feels bored when he's around her. Georgette Heyer cooks up romance between two people determined not to get married in Frederica. Lord Alverstoke is rakish. Frederica only wants a brilliant marriage for her bubbleheaded sister and then retire herself. Still, she has a certain charm for Alverstoke. I thinks it's Frederica's lack of reserve. She doesn't have to play the marriage game. Being a very eligible bachelor, he's used to women trying all kinds of tricks. The old adage of 'be yourself' seems to apply here. Although the relationship between them is an important part of the story, I enjoyed the Frederica's brothers' (and Luftra the dog) shenanigans. Frederica's family is important to her and bringing Alverstoke into that circle is a big deal. Seeing a normal, if rambunctious, family shows him that not all families are as selfish has his own. I liked Frederica a lot, especially the banter between Frederica and Alverstone, but not as much as The Talisman Ring. I think it might be that I found it a little long. However, it is still a fun book. the more book blogs i read, the more historical fiction i see. i finally gave in and selected a book in this genre! i'm looking forward to reading it soon. I've been ordering a lot of historical fiction for the library - partly based on titles on all of the blogs - and our patrons are thrilled! Heyer is a favorite. I'm behind on reading her and this book is one I haven't gotten to yet. I read and enjoyed The Talisman Ring (need to dust off the review and post it). Thanks for the review. Maybe I get to Frederica this year. This book sounds fun. Thanks for the review! 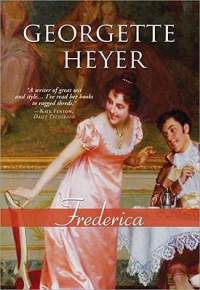 I love Frederica but then Georgette Heyer is an old favorite. The only book of hers I didn't love was......The Courtship? No. I can't remember. But it was much more realistic about a marriage made by their parents. I wanted more romance back then. I've been seeing Georgette Heyer around a lot lately but hadn't heard of her until recently. I'll definitely have to check out this one or The Talisman Ring.